Assignment 4: Textile Structures | Textiles Art Fun ! Assignment 4: Textile Structures – Textiles Art Fun ! A woven textile structure is used to advantage garments in which you would like to maintain the shape so as to avoid any stretching or bagging after wear. The woven structure works for any piece you would like to keep the appearance looking crisp, such as uniforms, formal wear, jackets, etc. The woven piece usually require more work to achieve the freshly pressed and pristine look as it tends to wrinkle easier thank knit. This textile structure might yield an unsatisfactory result if you are looking for comfort, stretch and movement in a garment. Sports, yoga and exercise apparel should know be woven as this textile structure offers little in the line of stretch so it would not offer a comfort during one’s workout regime. This is a knit piece and is appropriately used in this textile structure as this garment is a pair of yoga leggings. 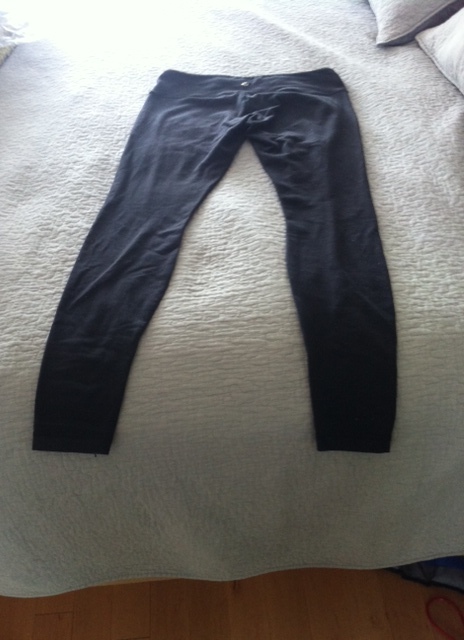 The garment is fabricated from 87% nylon, 13% Lycra Spandex. Knit is looped together and allows for stretch and movement, thus, providing a comfortable workout outfit. The knit textile structure might be used to advantage workout, yoga and exercise apparel. Movement causes pulling and tugging on fabric so having a piece that allows for some stretch while wearing will provide the ultimate experience in comfort. 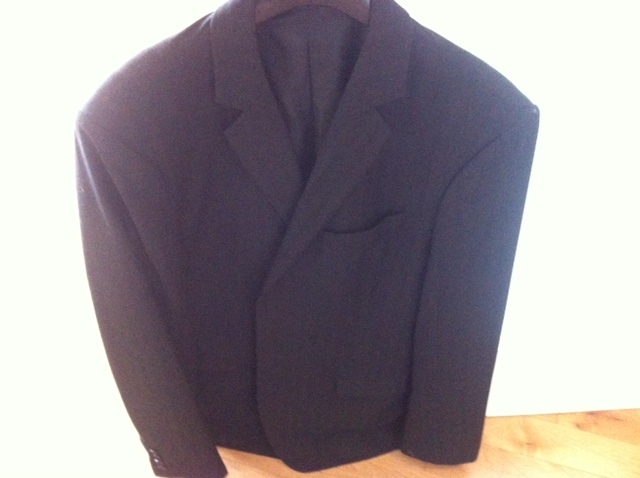 This is easy wearing and maintenance as it does not wrinkle as easily as a woven garment. A knit textile structure might yield an unsatisfactory result if you are looking to present in a more formal situation where you are required to have a crisp and professional appearance. Knitted textiles tend to have a more relaxed and casual look so are not often appropriate in certain work contexts. Formal dresses are another example where you would not want the garment to stretch. 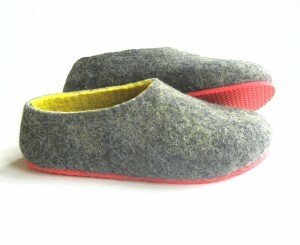 The felted textile structure is appropriate in this piece as slippers are created to provide warmth and comfort. The felted textile structure might be used to advantage slippers as the wool provides warmth and a cozy feeling the wearer hopes to gain from sporting these. They are tightly felted which would provide ultimate warmth and durability for something you will wear and walk in quite frequently. The felted textile structure might yield an unsatisfactory result if a summer top or pant were fabricated from this. Constructing summer apparel from felted material would be much too warm and bulky. The synthetic textile structure might be used to advantage because it is water repellent. It is created from pressing synthetic fibres together. It is also easy care which makes it durable for outerwear. Sportswear is often made of nylon as it has some properties making it suitable for exterior wear as an outer shell. Examples where this textile structure might yield an unsatisfactory result when you want something plant based thus more breathable and airy on a hot summer day. Specific Curriculum Outcome 2.2: Students will be expected to demonstrate an awareness of fibre and fabric construction techniques. Teacher will present information on fabric construction methods : woven, knit, felted and pressed or rolled (synthetics). Next, teacher will lead a discussion on fabric selection, using clothing and household items as examples and will provide a variety of fabric samples. Students will engaged in an interactive element and participate in a “Textile Structure Scavenger Hunt.” Divide the class into small groups and allow each group to gather as many items on the list as possible (i.e. woven garment, knit, felted, pressed or rolled, etc.) You may also incorporate previous content as review into the list (i.e. pattern, line, texture, etc.). The purpose of the scavenger hunt is to encourage students to look closely at fabrics. Students are invited to use microscopes or large magnifying glasses to examine various fabric samples. After the groups have located all pieces on their list they will be expected to examine the different qualities of fabric sample and will examine how the fabric is made. Students will then match fabric and or garments to potential uses based on durability, care, function, cost, and appearance and will share findings with the class. I like your classroom activity. I think the movement will encourage kids to get excited and there could be a level of competitiveness here, could be fun, while allowing students to get engaged in new and valuable learning opportunities. I agree with Jyl…getting the students moving around is always a good idea (I find, in working with 20-somethings). 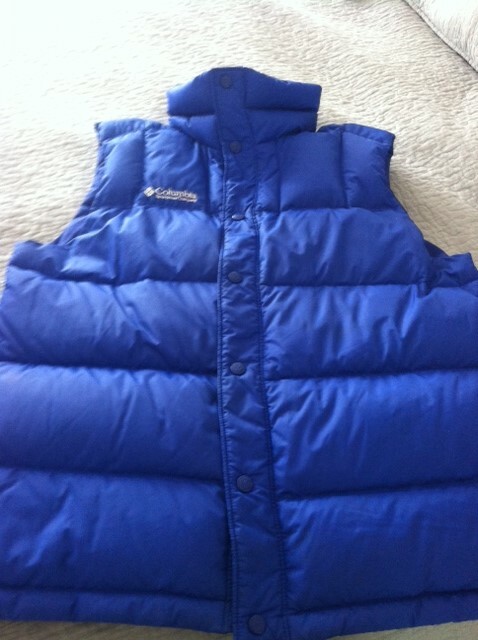 I can’t zoom in enough on the Columbia vest to see if it indeed rolled or if it is woven. I have a jacket made from a similar fabric that, although it appears rolled, and it is most definitely a synthetic, it is definitely woven. Very VERY fine threads. Plastic wrap for food would be an example of a rolled fabric. Heather has many examples listed on her blog. Definitely, rolled fabrics are synthetics, but not all synthetics are rolled.